Jointing the center seam of the soundboard is often the very first thing I like to do when I receive parts from a tonewood supplier. There is no better way to get acquainted with your soundboard-to-be than taking thin, wispy shavings off of it with a handplane. Here I am going to show you a simple method for jointing the mating edges of the center seam and gluing the bookmatched pair together, using a low investment in tools. The only high-cost item here is a good #5 jack plane which I highly recommend owning for a myriad of uses around your shop anyway. 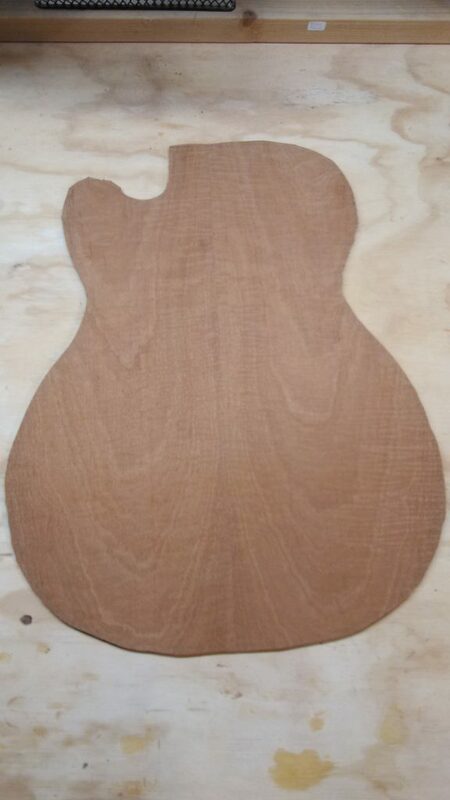 It is useful to draw out a rough outline of the guitar’s shape onto the plates. You can do this by tracing the outline from your mold or template. If you ordered your parts from an online supplier this has likely been done for you. I know that Luthier’s Mercantile International draws a dreadnought outline on its plates. This is for the purposes of grading. They assess the area within the outline to determine whether it is AA grade, AAA grade or otherwise. I start by inspecting the plates in the area of the center seam. Parallel grain on either side of the joint is optimal. I like to avoid grain run-out if I can, unless I am using a highly figured set for aesthetic reasons. Keep in mind, a highly figured set can be more difficult to joint. A highly figured set can be more difficult to joint. Stack the bookmatched halves on top of each other so that the centerseam edges are exposed on the same side. In other words, imagine the plates as a book and the centerseam is the book’s binding. Now flip the book closed. 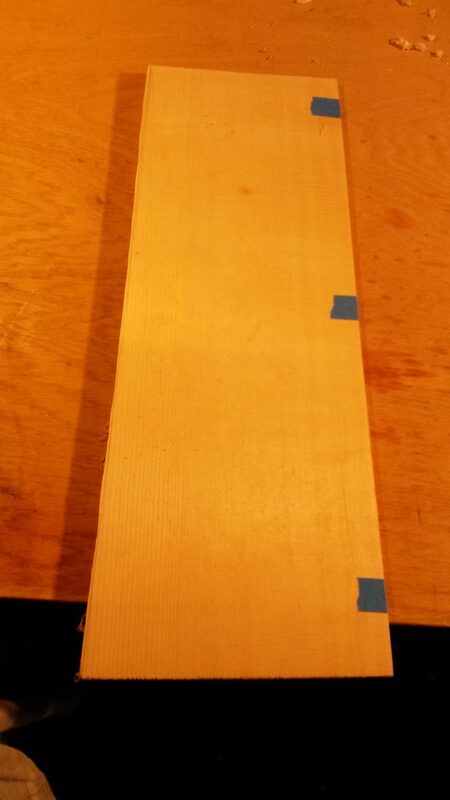 The “book binding” edge can now be planed flat. It is far easier to get a perfect fit by stacking the two pieces and planing them together like this than it is to plane each piece separately. Place the stacked halves on a shooting board with the mating edges of the center seam exposed to the plane. Place a weight on top of the stacked halves. I use this 20 lb. dumbbell because I like to use the dumbbell as a handle for my left hand while I’m shooting, but anything with a little heft will do. The weight helps to keep things from shifting while shooting. The plates stacked, weighted and ready to be jointed. I find that the best handplane for this job is the #5 Jack plane. 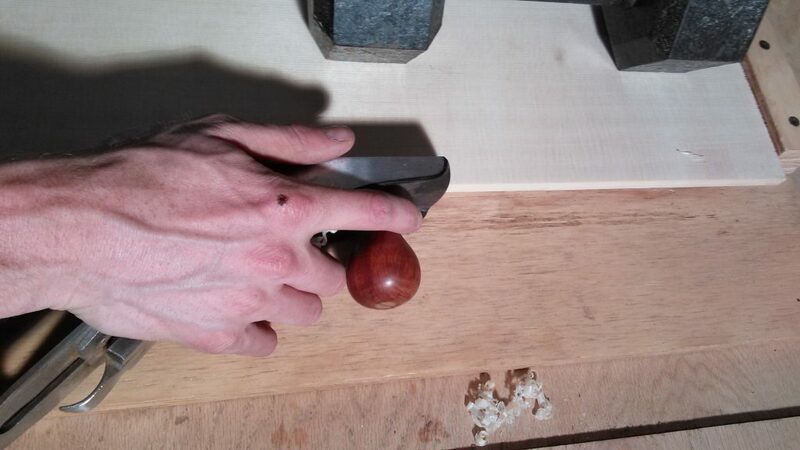 Do not use a block plane for this. The short length of a block plane’s sole won’t allow you to bridge a large enough portion of the working edge to ensure an even, flat cut. Run your fingertips along the mating edges of the center seam and make sure that they are flush to each other. You can use the sole of the handplane to press them flush. Make sure the center seam edges are flush with each other. To set up the plane, retract the plane’s blade all the way into its throat as a starting point, and then advance the blade from the throat slowly until it just barely protrudes from the throat. Now using light to moderate pressure, shoot the plane across the full length of the workpiece in the orientation shown in the picture below. If the first pass did not produce any shavings, then advance the plane blade from the throat by a hair and try again until you produce thin, wispy shavings. If your shavings are nearly translucent then you have found a good setting for your plane blade. Take 3 or 4 full length passes maintaining a consistent pressure against the entire length of the center seam. Be mindful not to tip the plane as you shoot. The next step is candle-lighting. This is where we hold the bookmatched pieces together against a backdrop of a light source and check the joint for light seepage. 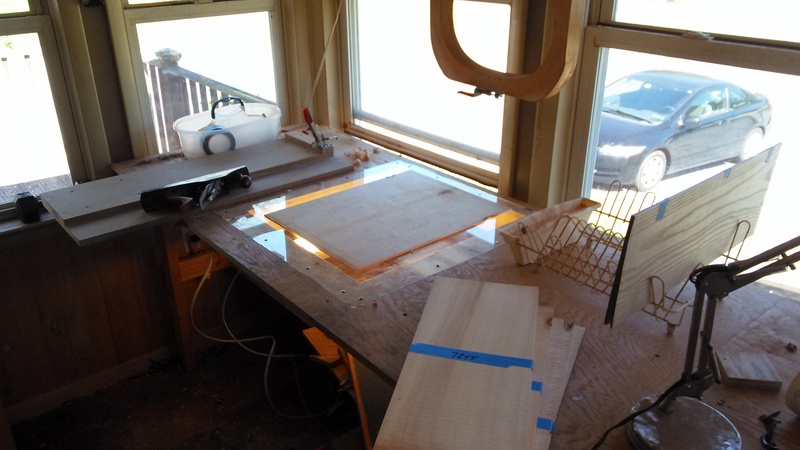 I simply pop one of the windows in my shop out of its sash and rest it horizontally with one end propped up on the window sill and the other end propped up by a chair. 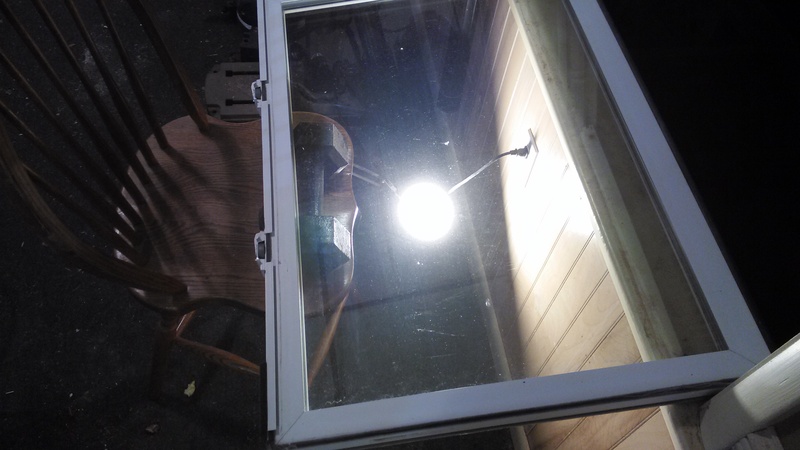 Then I place a desk lamp underneath, facing up towards the window glass. Voila! A simply solution to a light box and it doesn’t take up any additional space in the shop! Now hold the plates flat against the glass and scrutinize for light seepage. As you can see in the picture below, there is a lot of light seepage in the upper bout area of the soundboard. The lower bout (not visible in the picture) is a good tight-fitting seam at the moment. A special note on this seam: It is far more critical that the seam in the lower bout is perfect, than it is that the seam in the upper bout is perfect. 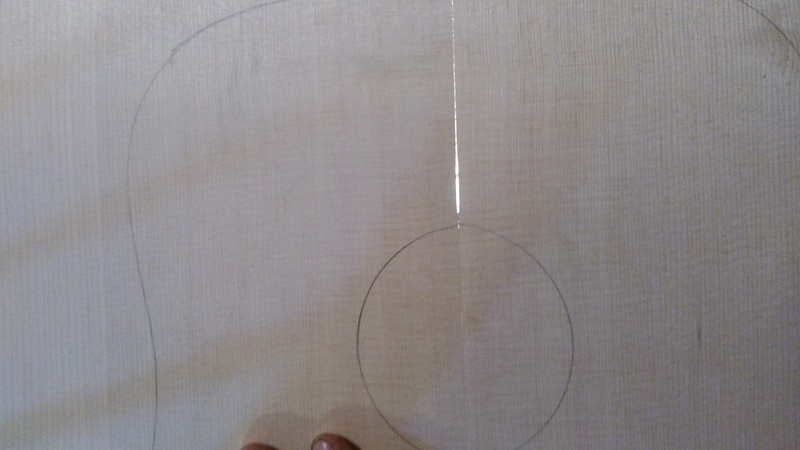 The reason is that the seam in the area of the soundhole is going to be cut out and the area above the soundhole is going to be reinforced by the fretboard when it is glued directly over the seam. 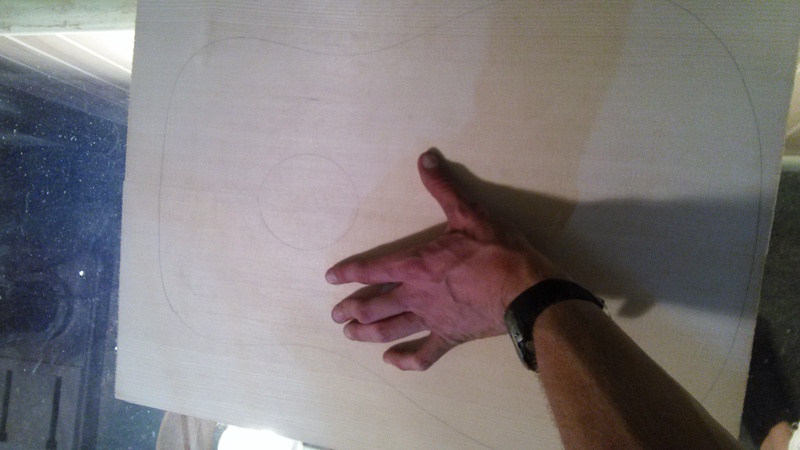 The area below the soundhole, however, is entirely exposed so, for both structural and cosmetic purposes, we want to be especially meticulous in the area of the lower bout. Even so, the light seepage in the upper bout pictured below is more than I am comfortable with leaving, so I need to take the plates back to the shooting board. The amount of light seepage that I will allow in the upper bout is not visible on camera. Place the weight and both halves on the shooting board as before and press together with the jack plane as before, checking the edge for flush with your fingertips. If the edges are not flush every time you return to the shooting board, then you will have erratic results. Now plane the edge as before, but only plane in the areas where there was not light seepage. ~2-5 passes and then check again. I usually do one full length pass to clean it up before candle-lighting again. 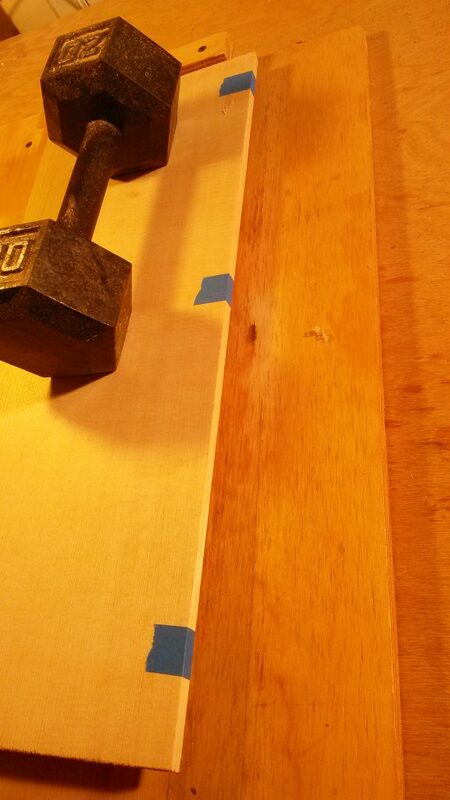 Note: If you are having trouble getting a good fit with the handplane you may want to consider sticking sandpaper to a good carpenters level as seen in the picture below and “shooting” the level. 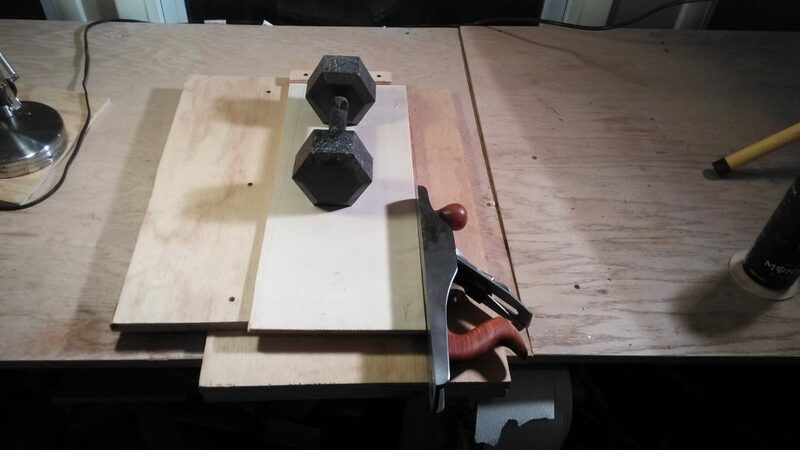 I keep a carpenter’s level on stand-by with 120 grit on one side and 220 grit on the other just for this purpose. 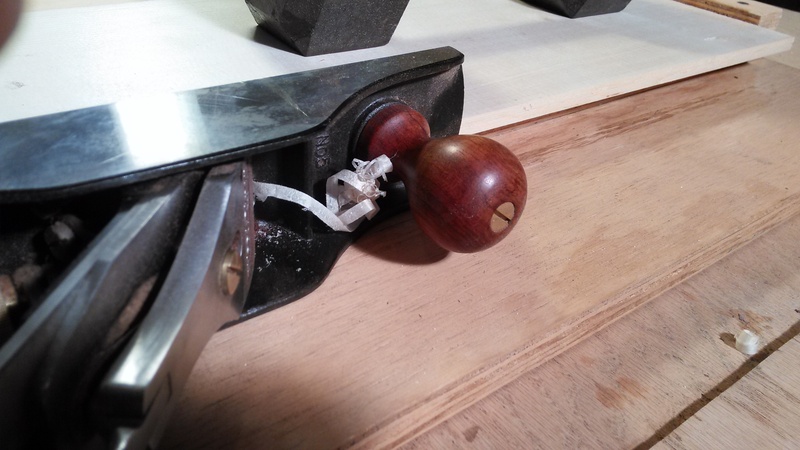 This is often easier than using the handplane for the novice user. However, there is an on-going debate about the structural integrity of sanded joints versus planed joints which I won’t get into here, except to simply say that I fall on the side of the planed joint being the better option. 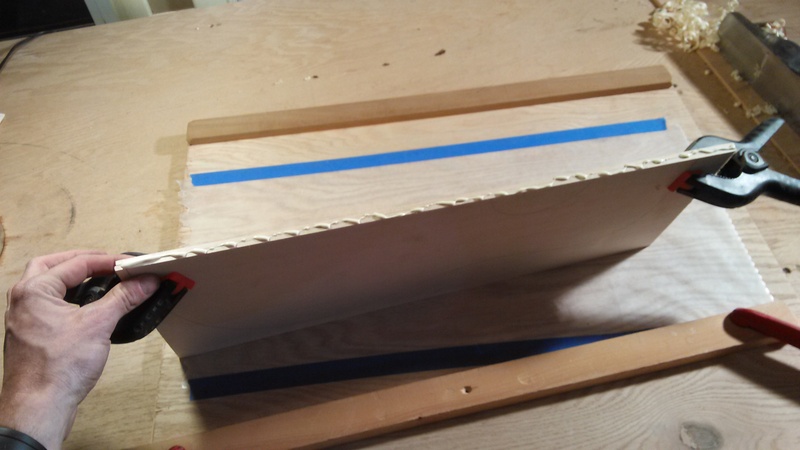 Once the edge is good, tape the edge flush using 3 pieces of low tack tape, such as the blue painter’s tape from painting and hardware stores. What we want to do next is cut the plates into a tapered wedge shape in preparation for gluing. We will then set our jig to match this tapered shape and tap the plates into place during glue-up. 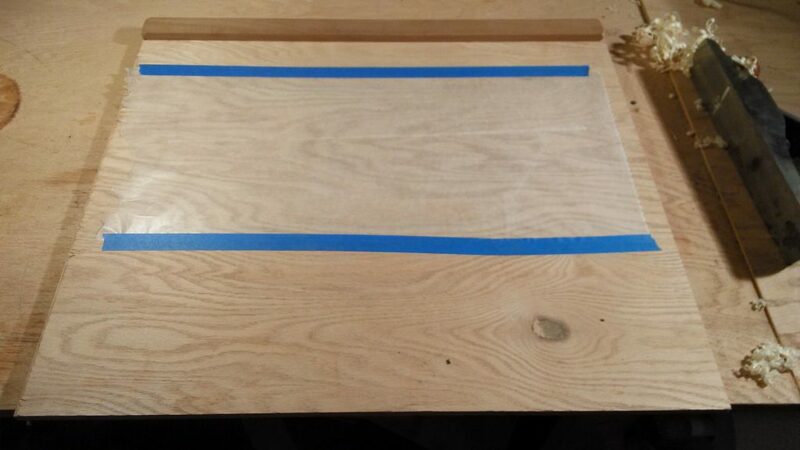 Use a straightedge to trace an angled line in the waste area of the stacked halves (the area outside of your outline). 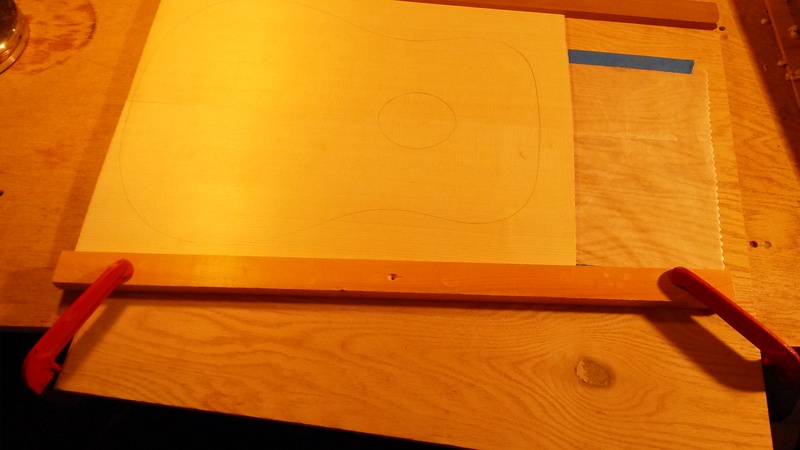 Cut freehand close to this line on a table saw or band saw. Now clean up the cut on the shooting board with a jack plane. Once the taper is smooth you can remove the tape. 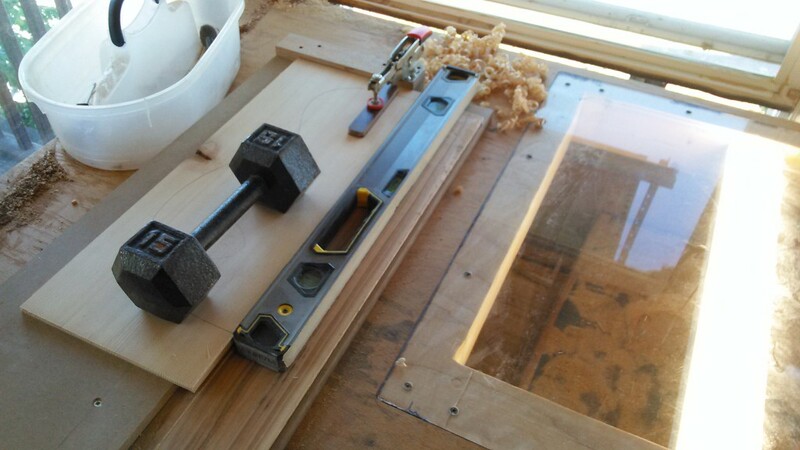 The fixture we will use for glue-up is called the joining board. It is nothing more than a flat, warpage-free plywood board (~24″ x 27″) with a batten screwed to one side. 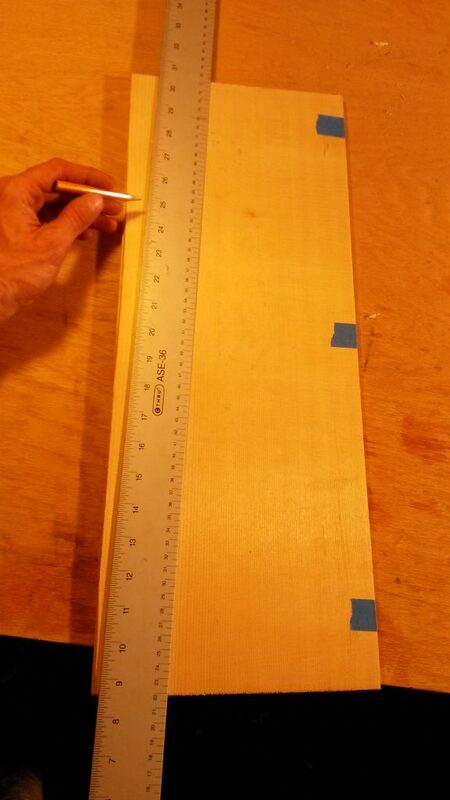 I tape some wax paper to the board in the area where the center seam will be. This way I don’t glue the soundboard to the joining board! Place the two halves to be joined on the joining board against the back stop. Place a straight board of approximately equal length to the back stop against the taper on the other side and clamp with 2 c-clamps as shown below. 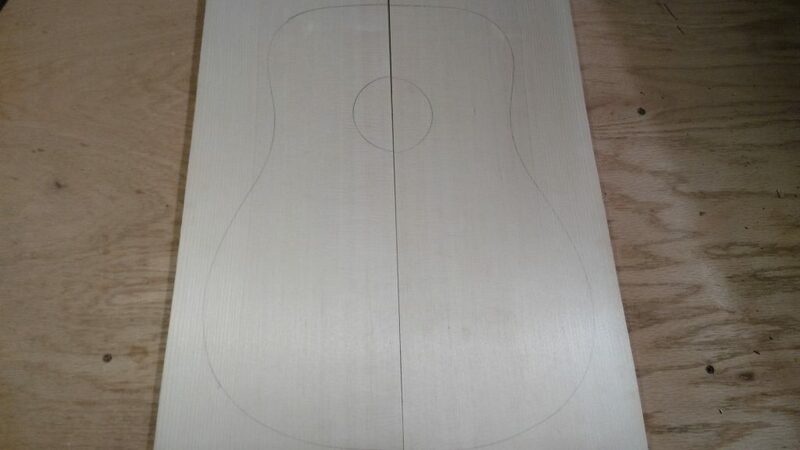 We have now matched our jig to the tapered shape of the soundboard. Remove the two halves from the jig. Stack the two halves so that you can spread glue on both edges at the same time. I like to clamp the two halves together with 2 spring clamps just to free up my hands. Spread Titebond glue on the edge with your fingertips. 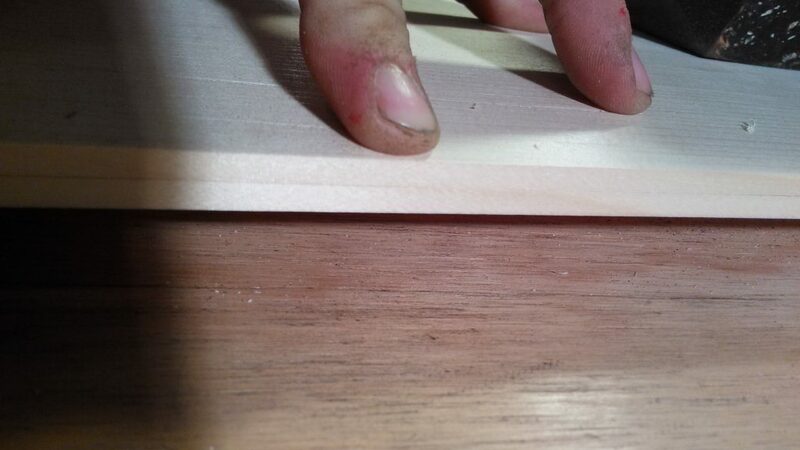 Make sure that there is adequate glue across the entire joint on both halves. If you spread too much glue then you will have a bit of a mess to clean up when it squeezes out, but if you spread too little you create a starved joint that may fail. It is always safer to err on the side of too much. 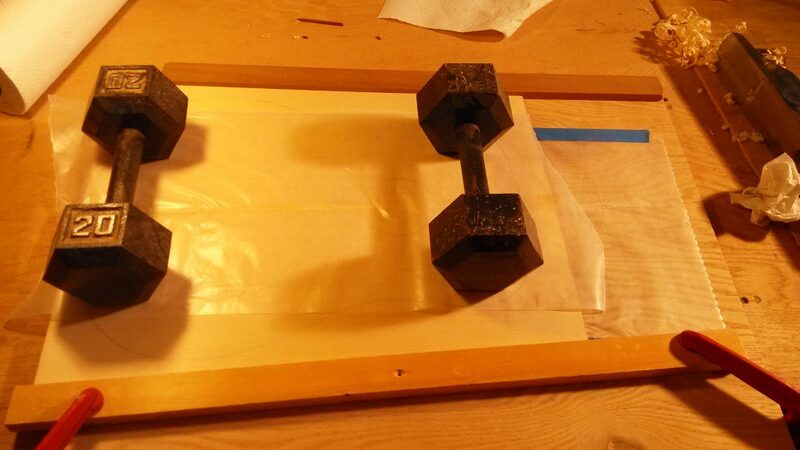 Now place the two halves back into position on the joining board with wax paper and some hefty weights on top. The weights keep the halves from flexing and popping out of place when we tap them in. Now you need a hammer or mallet and a small block ( I hope you read through this ahead of time and are not now scrambling for tools!). Using the small block against the end of the seam to distribute pressure to both halves, tap the soundboard very lightly into the tapered form. Just a few easy, light taps should provide adequate clamping pressure. Don’t just hammer away until you hear something snap! Tapping the plates into the tapered form. If I didn’t need it to take this picture, my other hand would be steadying the block! Place additional weights as needed in areas where one half is not sitting flush to the other. Let dry for at least 45 minutes. When you are ready to remove the soundboard, do not remove the weights first! This can cause the soundboard to buckle. 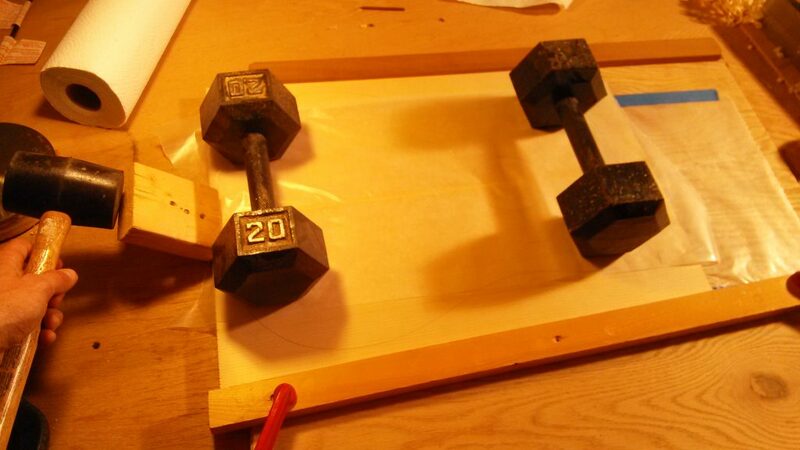 First remove the C-clamps and the straight board, then you can lift the weights. To view the Authors original post click here.